A very important event in Goa is the Zatra of Shantadurga. It is basically a colorful procession that is taken out in places like Mapusa, Pernem, etc. in Goa. The Zatra of Shantadurga is usually taken out in the month of December or January. The dates vary according to the Hindu calendar which is based on lunar cycles. 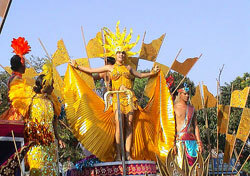 The "Zatra" or procession is marked by colorful festivities and merry making. Sri Shantadurga is considered to be a peace loving Goddess and this procession is taken out to honor her. According to legends, Sri Shanta Durga was the Goddess who reasonably settled a major dispute between Lord Vishnu and Lord Shiva. In Goa, there are basically three Hindu temples that worship Sri Shantadurga. These temples are located at Pernem, Kavlem and Footrope. These three places celebrate this festival with much zest and enthusiasm. The Zatra attracts scores of devotees every year in the month of December. The procession of the Shantadurga is very beautiful to look at. The entire day people indulge in merrymaking and sing and dance to begin the start of the procession. At night, beautifully decorated chariots bearing the idol of the Goddess take rounds of the nearby areas and spread goodwill and cheer all around. The chariots are decorated with colorful paper and streamers and idol is beautifully adorned with gleaming clothes and jewelry. It is a must visit in case you are visiting Goa in the month of December.